Is There Still Space for a Christmas Miracle? 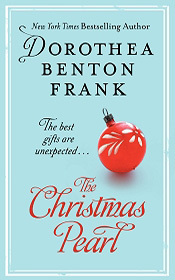 Just in time for the holidays, New York Times bestselling author Dorothea Benton Frank brings us her gift of THE CHRISTMAS PEARL (William Morrow, On Sale October 23, 2007, Hardcover, $14.95). Set in Charleston, South Carolina, this irresistible gem is filled with Frank's trademark Southern wit and charm and generous servings of Gullah magic from her own childhood. With humor and irrepressible heart, she captures not only the Lowcountry's unique culture but, more importantly, the universal longings, joys, and hopes the holiday season brings. Theodora Bryson has arrived at her ninety-third year, traditional as her mother's silver and clinging to the last vestiges of the old guard. But this Christmas she finds herself in a terrible conundrum. Her children and grandchildren have forgotten every value of importance in life, most especially conscience and decorum, and it is breaking her heart. During Theodora's childhood, Christmas was a season of sincere generosity, not disingenuous commercial extravagance. Decorations, treasured for generations, were unpacked and displayed. Gifts were everywhere, but they were thoughtful and homemade. Treats were abundant and every carefully planned meal was delectable. The air was suffused with balsam pine, baking fruitcakes, candied yams, and steaming biscuits. Most importantly, Theodora's beloved housekeeper, Pearl, who orchestrated all the pageantry, was always nearby to share her wit, wisdom, and warmth  and her love. THE CHRISTMAS PEARL is the story of a fractured family  their rivalries, insecurities, secrets, and lies  and how, through the desperation of Theodora and the magic of Pearl, they rediscover their deep devotion to each other. Pull up a chair to the perfectly set holiday table while Frank shows the grand old house as it breathes and rattles in protest and her characters do the same. But despite all their problems, the truth is: love never dies. This volume includes the recipes that bring Theodora's family together and vintage photographs of winters gone by. It's a classic holiday story, unique because of its Gullah influences, and a contemplation of mysterious things we may never quite understand. Most of all THE CHRISTMAS PEARL is the perfect treat to stuff in a stocking or share with loved ones of all ages. Dorothea Benton Frank is the author of seven New York Times bestsellers, from 2000's SULLIVAN'S ISLAND to 2007's THE LAND OF MANGO SUNSETS. Before she began her writing career, Ms. Frank was involved extensively in the arts and education, and in raising awareness and funding for various non-profits in New Jersey and New York. She and her husband Peter currently divide their time between the New York Area and her hometown, Charleston, SC, where their two children are in college.